So, I haven't played Aurora in a while, and I want to do something I’ve never done before: a multi-faction game, sort of inspired by Steve's Colonial Wars. I’ll be playing each faction, but to make it interesting, I’ll be developing some house rules governing each faction’s behavior. The basic idea is that it’s a multi-faction conventional start. Starting year: 2020 with no NPRs. To introduce a degree of randomness, I'm letting dice dictate my foreign policy. But just to note, I reserve the right to change any of this at any time to make a more interesting game. Every year, I roll 3d6 for each nation, which determines the shift in relationships. I won't start rolling until into the Trans-Newtonian age, when each nation starts claiming space. There is no relationship penalty for nations that are already hostile, so that international tension tends to ebb and flow. When a nation becomes allies with another, relationships with any nation belligerent or hostile to that ally immediately drop a level. Likewise, relationships with an ally’s allies increase by 1 level. Relationships falling to hostile don’t mean an immediate outbreak of war. Rather, every month, I roll 3d6 to determine if there is an outbreak of hostilities, and their severity. 3: Surprise attack! Rapidly growing tensions have allowed a random side to seize the initiative. 4: Outbreak of hostilities – negotiations break down, but both sides have time to mobilize beforehand. 5: Skirmish – I’ll play out a ‘limited’ engagement scenario. 6-7: Sabre-rattling increasing tensions: cumulative -1 to next rolls. 8-13: No change in tensions. 14-18: Negotiations ongoing: cumulative +1 to next rolls. If negotations reach a +5 modifer, tensions can no longer escalate, and relations are elevated to belligerent. Earth and Mutually-Assured Destruction rule: an attack on Earth is considered an attack on all nations of Earth. This includes any orbital bombardment or attack that causes environmental damage, but not skirmishes between ground troops. Each month of active war, I’ll roll 3d6 to determine the state of peace negotations. The roll is modified by +1 for each major fleet engagement, due to war exhaustion. If either side lacks the means to continue fighting, I may allow that side to surrender unconditionally. 1: Deceptive. The commander will try to use maneuver and guile to their advantage. 2: Aggressive. The commander will attempt to close with and destroy the enemy at all costs. 3: Timid. The commander’s goal is to preserve their own force, even at the cost of a decisive victory. I plan to develop this further as I go. I’m determing each nation’s ship/technology focus randomly. 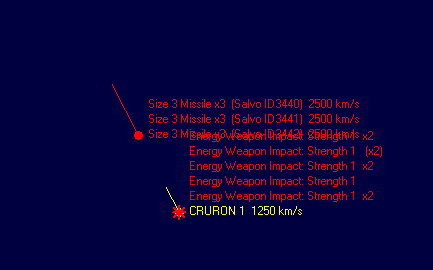 Weapon focus: Lasers (primary), railguns/gauss (secondary). The United States is just coming out of an isolationist period during the last administration that led to the dissolution of NATO and a souring of international relations across the globe, although it maintains its “special relationship” and military alliance with Great Britain. Following Brexit and the dissolution of NATO, Great Britain has been driven closer to her Commonwealth partners Canada and Australia, as well as the United States. With the NATO having been disbanded, the European Union has had to stand on its own against a new wave of Russian territorial aggression. Tensions are running high. Russia has continued the pattern of belligerence it’s set for the last several years, and has few friends in the international community, although relations are warming again with China, India and the Arab world. With the USA’s influence shrinking, the Arab League has fallen under the influence of the new, reformist Saudi King. Relationships with India have soured of late due to Saudi military ties with Pakistan. India is in a position to emerge as a global superpower, if it can avoid a war with China. China’s trade relationship with the United States has soured considerably in the last several years, and recent sabre-rattling over the disputed waters of the South China Sea have greatly increased tension with both India and Japan. While Japan’s economic miracle has long since worn off, it remains a highly developed, technological powerhouse. It remains allied with the United States; tensions with China have been steadily rising. I'll commense making diplomacy rolls in 2030. Have you tweaked starting industries too? Or does, for example, India have eight times as much as Japan, and Russia three fourths as much as the UK/Commonwealth? Your system looks good though, wonder how it'll hold up in actual play. I didn't tweak a whole lot. I'm playing everyone a little differently: countries that started with a huge industrial base like India and China can afford to splurge on 'luxuries' like extra shipyards and facilities, while smaller countries like Russia and the UK are putting everything into closing the gap by building factories. Right now, everyone's more or less at parity in terms of industrial capacity, except China, which is a beast, and Russia, which is lagging behind everyone else. India is about twice average in terms of industrial output, and China is 3x even that. I enable tech sharing between allies, so the US/UK/Japan are starting to pull ahead of China technologically. I'll probably buff Russia by allying them with the Arab League and especially China, if the EU joins the US/UK/Japan alliance once I start rolling in 2030. Also, because everyone started with so few research facilities, having appropriate scientists made a huge difference in how fast each is progressing. The brief period of international peace and stability that followed the end of the 20th century Cold War died in the early years of the next century. These first two decades were tumultuous, as many parts of the globe became embroiled in low-level conflicts, followed by a global economic collapse in the late 2000’s known to historians as the “great recession”. This upheaval led to a reactonary fervor that disrupted decades-old systems; in the Euro-American sphere, this manifested as an anti-globalist conservative isolationism that led to the United States rescinding its free trade agreements, the United Kingdom withdrawing from the European Union, and the disbandment of the NATO military alliance. Meanwhile, Russia turned to authoritarianism and aggressive territorial expansion. China, devastated by the breakdown of free trade, became more aggressive as well, with regional tensions skyrocketing over disputed islands in the South China sea. This political upheaval would last on Earth well into the 2030s. Everything changed, however, with the discovery of what would become known as Trans-Newtonian elements. The exotic matter properties of these substances revolutionized physics and material science; discovery is now credited to Chinese scientist Xiao Yi Zhu, who released his first findings in April 2022, although the report was initially classified as a state secret due to the military implications of the technology. American scientist Tyree Loughery, working independently, made the first public demonstration of Trans-Newtonian technology in late 2023. Despite being initially dismissed as a crackpot, the scientific community was forced to take note as other researchers quietly reproduced his experiments, leading to Dr. Loughery being awarded the Nobel Prize for their discovery. In July 2024, however, China shocked the world by launching the first manned spacecraft built using Trans-Newtonian principles. Although she used conventional chemical rocket engines for propulsion, her Trans-Newtonian inertialess drive enabled the vessel to reach speeds and distances unprecedented in any previous spacecraft. Other nations of the world could only watch as Chinese astronauts accomplished dozens of new records, including the first manned landings on Mars, and first permanent lunar base. India would launch its first Trans-Newtonian vessel in 2025, followed a month later by Japan. By October, China, making full use of its technological head-start and massive industrial capability, had established the first permanent civilian colony on the moon. The United States launched their first TN spacecraft in February 2026, the Neil Armstrong. However, they still lacked the orbital infrastructure to build spacefaring cargo and colony ships capable of sustaining a colony, which was a serious blow to the national pride of the country that won the first “space race”. In December 2028, however, Japan and the United States launched the nuclear thermal rocket-powered spacecraft, capable of speeds in excess of a thousand kilometers per second. This opened up the outer solar system to human exploration. Meanwhile, Chinese colonists had established an outpost on Mars. In 2029, the United Kingdom, in cooperation with Commonwealth partners Canada and Australia, launched their first two TN vessels, Hydra and Medusa, becoming the fifth nation with operational TN spacecraft. In late 2029, a Chinese-flagged civilian orbital shuttle, the Horizon, is hijacked – ostensibly by Uighur separatists, and crashed into a chemical fuel depot in the main Chinese spaceport on Mare Imbrium. Several hundred lives are lost. In response to the Horizon incident, the Chinese begin work on a force of armed space craft, in order to protect against piracy and terrorism. Although conventionally-armed spacecraft are legal under international law, this causes an uproar, as Chinese critics fear that this is a prelude to withdrawing from the Outer Space treaty and claiming the Moon or Mars as exclusive Chinese territory. The United States is the only other nation immediately capable of creating armed spacecraft, and by the end of the year, authorizes the creation of its own armed space force. There is great fear internationally that the two superpowers have spurred a new arms race in outer space. By 2030, China has a thriving Lunar colony of 3.41 million, and 110,000 on Mars. India has a small colony of 200,000 on the moon, and is preparing to settle on Mars. India has the largest space fleet, with two colony ships, four freighters, and eight survey vessels. They are currently tooling up to produce nuclear thermal transports. China has the second largest space fleet, with 1 colony ship and six freighters servicing her colonies, and four survey ships. Like India, all are conventionally-powered, although the first nuclear thermal ships are under construction. Six laser-armed patrol frigates are fitting out in Earth orbit. Japan has a fleet of six survey ships, all of which have been refit to nuclear thermal propulsion, and is about two years away from opening their first civilian shipyard. The UK has two nuclear-powered survey ships, and is also about two years from opening its first civil shipyard. The US has four nuclear-powered survey ships, and has a colony ship and transport under construction. Work is slated to begin on two railgun-armed patrol cruisers by the end of May. The Arab League is cooperating to build its own orbital facilities, but is at least three years away from a nuclear-powered spacecraft. The European Union has no vessels yet but is perhaps a month away from laying the keel of a fleet of nuclear-powered survey and transport ships. Russia is perhaps perhaps four or five years from launching its first TN spacecraft. The long period of strain in United States-European relations following the upheaval of the late 2010s is beginning to mend (US/EU relations improve to friendly). Meanwhile, the UK issues a statement supporting Japanese fishing interests in the disputed South China sea, causing a rift in Sino-British relations (UK/China relations reduced to distrustful, UK/Japan relations improve to friendly). However, the European Union backs China over India in a similar trade dispute (EU-India relations reduced to distrustful, EU-China relations improve to open); with regional tensions rising, India and Japan begin making overtures towards a closer partnership (India-Japan relations improve to open). China launches five Q-1-class frigates. Intelligence analysts across the globe take quick note that these ships are much more than enough to secure cislunar space from makeshift pirates or hijacked shuttles - the only reasonable opponent would be something only another nation-state can build. Is China planning an interplanetary empire? The fact that five more ships are immediately ordered begins a flurry of weapons research among the spacefaring powers, again stoking fears of a worldwide arms race in space. The United States establishes its own colony on Mars. UK-Russian relations fall after yet another Russian dissident expatriate dies under mysterious circumstances in London. The UK also increases its defense ties with Japan, creating a three-way alliance between the US, UK, and Japan. Japan's relations with the EU also improve. Three Luhu-class ships are launched by the Chinese. They give the burgeoning Chinese People's Liberation Army Navy's space division a standoff ability, albeit a primitive one. The European Union launches its first 5 Deimos-class survey ships. The United States commissions two San Francisco-class cruisers - the first challenge to Chinese space superiority. With space combat now the province of serious discussion and debate, instead of science fiction, a resolution is introduced by the UN that introduces a "safe haven" principle to the laws of warfare - due to the risk posed to all the orbital infrastructure of all nations by space debris, combat and weapons testing within low Earth orbit is outlawed, as is the use of space-to-ground weapons against Earth, specifically. China begins surreptitiously building a fleet maintenance yard on Mars, where military installations are expressly forbidden by the Outer Space Treaty. Sino-American relations have been heavily strained since US intelligence revealed that the Chinese are building a large military base on the surface; Mars has a population of nearly a million people split roughly equally between the US, China, and India. In early 2031, the Chinese began flexing their military muscles in Mars orbit, boarding and harassing US-flagged merchant ships. By March, it had become a general blockade as the Americans refused to concede to Chinese demands. By May, the United States issued China an ultimatum, demanding an end to the blockade by the end of the month. This request was ignored. On June 1st, the United States' entire combat-capable fleet departed Earth orbit. The PLAN's second frigate squadron attempted to pursue, but was unable to match the speed of the American cruisers. 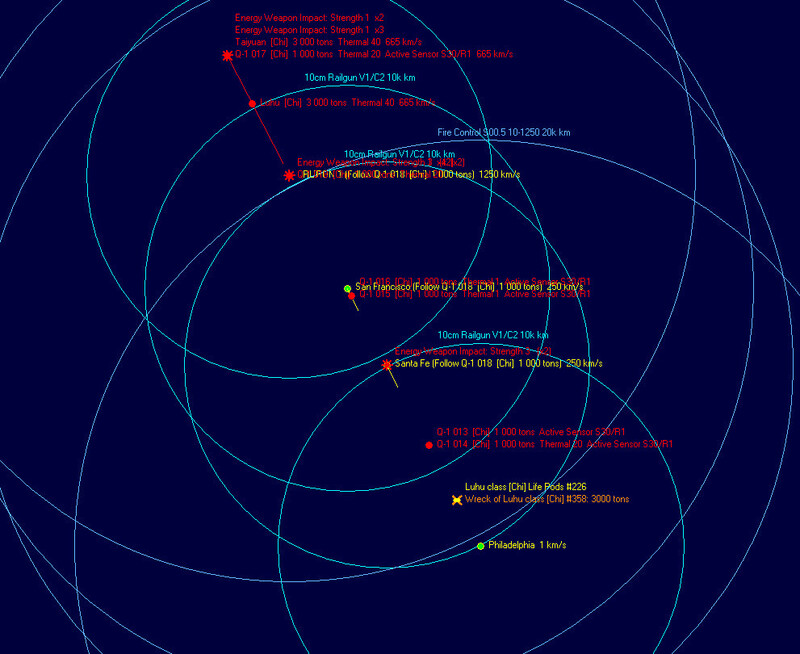 The Chinese detect the US squadron at a distance of 6 million kilometers. The Chinese commander's demands for an immediate withdrawal are ignored. She issues a warning that if the squadron proceeds to Mars, it will be fired upon. At a distance of 4.5m km she opens fire, launching most of her forces' complement of missiles. At 1041, the US force detects the enemy missile volley, and Captain Orme orders the fleet to reverse course. Every incoming missile is brought down by concentrated point-defense fire from the squadron's railguns. At 1114, the two fleets meet. The Chinese have a precious range advantage, but it is squandered for want of training - never before have two fleets fought in space, and these precious seconds slip by before they are able to open fire. The Americans close the distance. The battle is short and furious. The Chinese focus their fire on the flagship Philadelphia, the Americans, on Guangzhou. In the first ten seconds, Guangzhou is ripped apart by American railgun fire, but Philadelphia is devastated by laser hits to her drive section that leave her dead in space, unable to fight. The Americans shift fire to Luhu, the Chinese, to Santa Fe, and both are rapidly rendered combat-incapable, Santa Fe losing four of her five engines. San Francisco is badly damaged, next, but remains in the fight, knocking out the Taiyuan, while Phoenix engages the frigates. The Q-1-class's lasers pack a punch, but are slow to fire and they are unarmoured, making them extremely vulnerable to railgun fire. They are able to inflict moderate damage on Phoenix before all are disabled or destroyed. The entire engagement lasts less than five minutes before the surviving Chinese ships, crippled and unable to fight, scuttle themselves and abandon ship in order to preserve the lives of their crews. Survivors on both sides are left stunned. Both opponents had expected the other to blink - and no one did. The Americans have won a pyrrhic victory; the entire enemy force has been destroyed, but the entire American space force is combat-ineffective, and the Chinese have four more squadrons of frigates and another squadron of destroyers at their disposal. Without supplies, the American cruisers have little chance of returning to the safe harbor of Earth orbit. The political leadership on both sides are stunned as well. A cease-fire is reached soon after word of the battle reaches Earth; China saves face by placing the blame by forcing LCDR Liang Jiao Zhu, who survived, to admit to "firing without proper authorization", while Washington, knowing the hopelessness of the military situation, agrees to many of the concessions sought by China. Nevertheless, the surviving American ships return to Earth with a hero's welcome; CDR Chris Garber and CPT Lorraine Orme are awarded the Silver Star. The Chinese survivors are quietly repatriated, but none ever serve in space again. Total: 152 survivors, 361 dead. Philadelphia heavily damaged. 30 KIA. Phoenix moderately damaged. 10 KIA. San Francisco heavily damaged. 30 KIA. Santa Fe heavily damaged. 33 KIA. Total: 297 survivors, 103 dead. Strategists and intelligence analysts in every nation keenly analyze the results of the battle; chief lessons-learned include: The United States had a crucial advantage in armament. Their railgun armament was extremely effective against the unarmoured Chinese frigates, and their dual fire controls allowed them to effectively sweep them from space once the Chinese destroyers were dealt with. The Americans were faster, but once the battle was joined, this had little impact on the outcome, as most of the action occured in a less than two minute window - both sides had to close to very close range to attack, and after the first pass, neither side was able to withdraw. Neither side had adequate armour protection to fight a pitched battle. The Chinese did have one important technological advantage, in that their ships were equipped with Duranium armour, as opposed the conventional material used in the American's ships. However, the Chinese may well have won if they would have been able to open fire immediately on the American fleet, before they closed into railgun range. The Chinese acquitted themselves well, considering they had a 3/4 tonnage disadvantage, not taking into account the Chinese missile launchers, which were essentially wasted tonnage.A few missile hits were scored once the Americans entered knife-fighting range, but none of the missiles fired from range made it past the American railguns. Perhaps missiles can be made into a useful ship-to-ship combat weapon, but not without significant investment in research and development. China has never historically been an imperialist military power. China's space policy is guided by the simple reality of resource scarcity and overpopulation; by 2031, the Chinese population is approaching 2 billion. China needs to secure the moon and Mars as colonies in order to avoid ecological disaster if not an all-out Malthusan collapse. Withdraw from the Outer Space Treaty, which prevents any nation from making a terrorial claim on an extraterrestrial body, as soon as convenient. 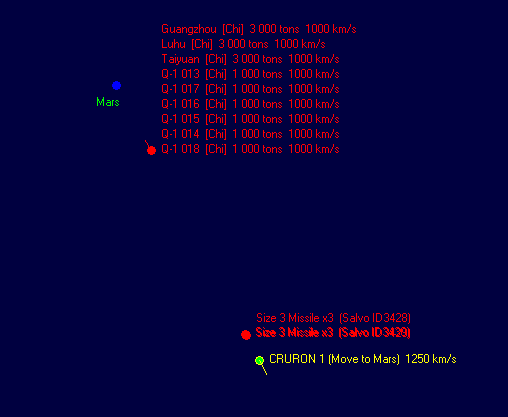 Continue naval build-up in order to enforce Chinese territorial claims on the moon and Mars. Shift industrial production towards terraforming installations. As China possesses by far the largest Trans-Newtonian industrial base, it is the only country capable of undertaking such an ambitious plan as terraforming another world. Relocate a sizeable amount of industrial production to the moon, in order to prevent a crippling first strike from Earth-based anti-satellite weapons. Once terraforming of the moon and Mars begins, focus on mineral development, surveying and claiming resource-rich bodies. Earth has, at most, 100 years of Trans-Newtonian resources left at current production levels. The European Union establishes its first permanent lunar colony. The United States and European Union sign a mutual security agreement, affirming every nation's right to freely navigate and colonize the solar system (EU-USA Alliance). Despite attempts at reconciliation after the "Mars incident", Sino-American tensions continue to rise (US/China relations fall to belligerent). China's rival India begins making diplomatic overtures towards the United States as well (US/India relations improve to friendly), while relations between India and the EU cool (EU-India relations fall to distrustful). Sino-Russian relations are also declining (Russia/China relationship reduced to neutral). Feeling threatened, China and the Arab League enter into a mutual defense agreement (China/Arab League Alliance). India has over a million colonists on the moon, and to protect them against the Chinese naval threat has begun working on its own fleet of Trans-Newtonian warships. The first six of these come into service in February 2033. The latest Chinese warships, the Jiangwei-class of missile destroyers, are delivered. They are essentially an enlarged Luhu. Chinese anti-ship missile technology has also been substantially improved, but not yet tested in combat. Japan becomes the next nation with an armed presence in space, as the Japanese Space Self-Defense Force launches three Akikaze-class destroyers. Japan now has the spacelift capability to establish an extraterrestrial colony, but has not, due to the high tensions. The United States and India sign a mutual-defense pact to contain the threat of Chinese aggression on the moon and Mars (USA/India allied). Tensions rise between the UK, China, and the Arab League in response (UK/Arab League relationship falls to distrustful, UK/China relationship falls to belligerent). Russia's relationships with the Arab League and India are cooling as well (Russia/Arab League relationship falls to distrustful, Russia/India to neutral). Tensions between India and China over lunar mining rights are reaching a crisis point (India/China relations fall to hostile!). China deploys two battalions of "peacekeeping forces", equipped with prototype Trans-Newtonian equipment, to the moon and Mars. India and the United States lodge formal diplomatic protests, which are ignored. The United Kingdom commissions their first space warship, HMS Leopard. The Leopard is comparable to the latest Chinese Q-2 class frigate, of which half a dozen are already in service. Meanwhile, The Americans commission three new Minneapolis-class cruisers. Their new duranium armour scheme greatly improves on the San Francisco-class in both protection and firepower. The Nations of Earth have largely split into two factions. The United States, UK, Japan, European Union, and India stand more or less united in opposition to China's expansion and military build-up; China has leveraged her economic ties to Africa and the Middle East to form a security and economic partnership with the Arab League, although the latter is perhaps two years away from being able to contribute militarily. Russia remains an international pariah, completely left behind in the race to space. China now maintains a colony of 8.69 million people on the surface of the moon, and another 430,000 on Mars - infrastructure development has slowed in order to develop local industry. The European Union has a population of 2.41 million on the moon. India has 2.04 million, and another 600,000 colonists on Mars. The United States has a Mars colony of 350,000 people. The Arab League maintains a small fleet of survey ships, and no warships as yet. China is the system's leading military power, with six Jiangwei-class and six Luhu-class missile destroyers, thirty Q-1 and eighteen Q-2-class frigates in service, for a total of 90,000 tons. The European Union has a fleet of survey ships and auxiliaries to support their lunar colony, and will soon be ready to lay down their first warships. India has a single DD-1-class particle beam destroyer, and 24 FF-1-class railgun frigates - 27,000 tons total. Japan has six Akikaze-class destroyers in service - 24,000 tons. Russia has yet to develop a Trans-Newtonian space program. The UK has only the 1,000-ton Leopard, although the first three 4,000-ton Centaur-class cruisers are slated to be delivered in mid-January 2035. The United States has six San Francisco-class railgun cruisers in service, and three Minneapolis-class - 45,000 tons. This is really cool, I am following with great anticipation. I do hope that China's industrial lead doesn't make it to overpowered, but the growing alliance against them should counteract that for now. Fantastic to see a new story here! This is an especially intriguing start, keep up the good work! Could you post the specs of the conventional freighters and colony ships that the powers used? The crowd demands an update! I'm pretty loaded down with university coursework. Might be a while before I have any time to dedicate to games, but I'll try to get an update out. The military buildup continues. In January, the UK launches its first Centaur-class warships. Although Britain so far lacks off-world colonies, their government has committed themselves to making a strong military contribution to the US-UK-European alliance. By October, India completes its first order of three Bangalore-class cruisers in late 2035, and three more by the end of 2036. The class is roughly comparable to the American Minneapolis, but mounts a pair of long-range particle beams instead of lasers. In January, the EU launches its first Lion-class frigates. The India-Pakistan crisis is resolved by summer 2036 without further conflict. By the end of the year, western intelligence agencies have determined that China is constructing missile bases on Earth, the Moon, and Mars with long-range surface-to-orbit capability. The discovery sets off a diplomatic firestorm, as contsructing military installations, much less missile bases, on other worlds is an express violation of the Outer Space Treaty. Despite international sanctions, China formally renounces the treaty - it now possesses by far the largest trans-Newtonian industry, and is no longer reliant on foreign trade to fuel its economy. In 2037, the first Arab League-flagged colony ships land on Mars, welcomed by the Chinese government. China remains the dominant off-world power, with 11.2 million citizens on the Moon, 3.92 million on Mars, and an Earth population approaching 2 billion. They possess six Jianghu-class missile cruisers of 5,000 tons, six Jiangwei-class missile destroyers of 4,000 tons, six 3,000 ton Luhu-class destroyers, 42 1,000 ton Q-1-class frigates, and 48 1000-ton Q-2 class frigates, for a total of 108 combatant vessels massing 162,000 tons - as much as the two next largest powers combined. They have also deployed 5 battalions of mobile infantry to Mars, 1 to the Moon, and have 2 on Earth with their remaining conventional forces. India has a similar Earth population to China, but roughly half the industrial capacity. They have 2.67 million citizens on the Moon, 620,000 on Mars. They have a fleet of six 5,000-ton Bangalore-class cruisers, 5 3,000-ton DD-1-class destroyers, and 60 1,000-ton FF-1-class frigates, totalling 105,000 tons. They have four TN mobile infantry battalions on Earth, in addition to conventional forces. The Arab League is tooling up to produce their first TN warships. They have a small colony 20,000 citizens on Mars. The European Union has a colony of 11.2 million on the Moon. They have 24 Lion-class frigates in service, totalling 48,000 tons, 3 MI battalions on Earth, and 1 on the Moon. Japan has no off-world colonies as of yet; they have the means, but not the will, due to global tensions. They have 12 4,000-ton Akikaze-class destroyers in service, totalling 48,000 tons, and three MI battalions. Their military buildup has caused continual fuel and material shortages, however, and is stifling their economy. Russia so far lacks any off-world colonies, and has yet to break ground on a trans-Newtonian space program. The UK, like Japan, lacks any colonies of their own, but possesses a force of 9 4,000-ton Centaur- class cruisers, 36,000 tons total. Also like Japan, they are facing a severe fuel shortage that has prevented them from meeting their training and readiness goals. They have 3 MI battalions on Earth. The United States has a colony of 5.26 million on Mars. They have six Minneapolis-class cruisers, and six more of the older San Francisco-class, all of 5,000 tons, or 60,000 tons total. They have two MI battalions on Earth, and two more deployed to the Martian surface. Good update, things are definitely heating up! Just start reading it, and I loving it !